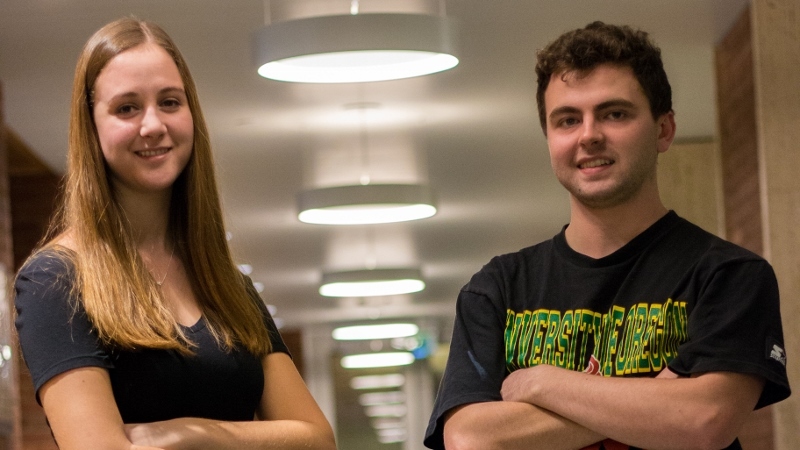 Sophomores Ally Waldon and Jack Pitcher are the winners of the Clark Honors College Student Research Paper Awards for work produced in spring 2016, and both are pretty excited. “After I got the email, I immediately called my parents,” Pitcher said of his initial reaction to the news. Each year, the honors college reviews student papers from the research course section that students take in their first or second year in either arts and letters (HC 223H) or social science (HC 233H). Both Waldon, a human physiology major, and Pitcher, a business major, wrote their papers for professor Ocean Howell’s history course on urban studies last spring. For her project, Waldon discovered that during the Industrial Revolution canneries in Maryland employed a large number of children, forcing them to work long hours in dangerous conditions. “They were kids who were 5 years old working in a canning mill who should have been in school,” she said. While regulations prohibited this type of child labor, Waldon found that the laws weren’t being effectively enforced in Maryland. Pitcher decided to look to his hometown of Portland for ideas on his research topic. He wanted to better understand the history of this segregation, especially in relation to how the city’s journalists covered race issues in the mid-20th century. He scoured archives from newspapers like The Oregonian for research material, and what he found is a sobering reminder to a state that is often hailed as socially progressive. Up until the 1960s, when the civil rights movement really took shape, Portland media reported no issues of segregation in the city’s schools. “I was able to find data on percentages showing that schools became segregated in the ‘40s, even when they weren’t seeing it as an issue,” Pitcher said. Howell required his students to complete a prospectus of their research topic and present the significance of their research to the class. The topic also had to be completely original. This process is a shrunken-down version of the thesis all honors students must finish before they graduate. “I think this will be helpful when I start working on my actual honors college thesis,” Waldon said of the research project. For Pitcher, the project was quite the challenge, but he was proud of the work he did. The Honors College will review student research papers from the coming spring 2017 research courses for award selection based on professor recommendations. The winners will be announced next year.